 Women Who Hurt Themselves explores the suffering of women who reenact childhood trauma, particularly abuse or neglect, through self-destructive behavior. Miller is a therapist who has treated hundreds of women with this condition (which she labels Trauma Reenactment Syndrome, or TRS) and whose behaviors include self-mutilation, alcoholism, drug addiction, and eating disorders. She argues that women with TRS did not feel protected as children, and thus have trouble protecting themselves as adults. She explains what TRS is and outlines her therapeutic program, which begins by exploring the symptoms and, as therapist and patient develop a trusting relationship, gradually moves into an examination of the original trauma. The goal of therapy is for the patient to develop her own ``protective presence.'' Miller's responsiveness as a therapist is evident; she warns against blind adherence to existing formulas, stressing the need for multifaceted approaches to abuse and addiction. She cautiously avoids buzzwords and admirably emphasizes the differences in women's situations. However, the breadth of experiences that could be described as traumatic, and of behaviors that could be called self-destructive (chain-smoking and sexual promiscuity are included), make this book confusing for the lay reader. 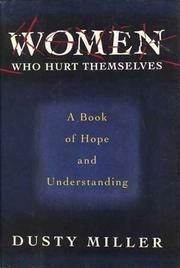 Surely women inflict violence on themselves for a variety of reasons; like much recovery literature, Women Who Hurt Themselves may exaggerate the explanatory power of trauma. Further confusing the discussion are the many traits that Miller attributes to TRS that are actually common to women with a wide variety of histories--excessive apologizing, for example, or caring for others at the expense of oneself. Women Who Hurt Themselves should be helpful to mental health professionals who work with female trauma survivors, though some of its generalities should be taken with caution.